The song was written in collaboration with Lori Lieberman, who recorded the song in late 1971. In 1973 it became a number-one hit in the United States and Canada for Roberta Flack, also reaching number six in the UK Singles Chart. The song has been covered by many artists; the version by the Fugees won the 1997 Grammy for Best R&B Performance by a Duo or Group with Vocal. According to Lori Lieberman, who performed the original recording in 1971, the song was born of a poem she wrote after experiencing a strong reaction to the Don McLean song "Empty Chairs", writing some poetic ideas on a napkin at the Troubadour Club after seeing him perform the song, and then relating this information to Norman Gimbel, who took her feelings and converted them into song lyrics. Gimbel passed his lyrics to Charles Fox, who set them to music. According to Gimbel, he was introduced to the Argentinian-born composer Lalo Schifrin (then of Mission: Impossible fame) and began writing songs to a number of Schifrin's films. Both Gimbel and Schifrin made a suggestion to write a Broadway musical together, and Schifrin gave Gimbel an Argentinean novel—Hopscotch by Julio Cortázar—to read as a possible idea. The book was never made into a musical, but in chapter two, the narrator describes himself as sitting in a bar listening to an American pianist friend "kill us softly with some blues". Gimbel put the phrase in his "idea book" for use at a future time with a parenthesis around the word "blues" and substituted the word "song" instead. Don McLean said he had not known that the song described his singing and, when asked about it, said "I'm absolutely amazed. I've heard both Lori's and Roberta's version and I must say I'm very humbled about the whole thing. You can't help but feel that way about a song written and performed as well as this one is." Nevertheless, Fox repudiated Lieberman's role in the song's creation, saying: "We [Gimbel and Fox] wrote the song and [Lieberman] heard it and said it reminded her of how she felt at [a Don McLean] concert. Don McLean didn't inspire Norman or me to write the song but even Don McLean thinks he's the inspiration for the song." McLean supported Lieberman, both on his website and from the stage of a concert which he invited her to attend in 2010. However, the matter only reached an unequivocal conclusion when contemporaneous articles from the early 1970s were retrieved, all of which vindicated Lieberman. In an April 5, 1973 article in the New York Daily News, Norman Gimbel was quoted as follows: "She [Lori Lieberman] told us about this strong experience she had listening to McLean ('I felt all flushed with fever / Embarrassed by the crowd / I felt he had found my letters / And read each one out loud / I prayed that he would finish / But he just kept right on'). I had a notion this might make a good song so the three of us discussed it. We talked it over several times, just as we did for the rest of the numbers we wrote for this album and we all felt it had possibilities." (1972) "Killing Me Softly with His Song"
Lieberman was the first to record the song in late 1971, releasing it in early 1972. Helen Reddy has said she was sent the song, but "the demo... sat on my turntable for months without being played because I didn't like the title". Roberta Flack first heard the song on an airline, when the Lieberman original was featured on the in-flight audio program. After scanning the listing of available audio selections, Flack would recall: "The title, of course, smacked me in the face. I immediately pulled out some scratch paper, made musical staves [then] play[ed] the song at least eight to ten times jotting down the melody that I heard. When I landed, I immediately called Quincy [Jones] at his house and asked him how to meet Charles Fox. Two days later I had the music." Shortly afterwards Flack rehearsed the song with her band in the Tuff Gong Studios in Kingston, Jamaica, but did not then record it. In September 1972, Flack was opening for Marvin Gaye at the Greek Theater; after performing her prepared encore song, Flack was advised by Gaye to sing an additional song. Flack later said, "I said well, I got this song I've been working on called 'Killing Me Softly...' and he said 'Do it, baby.' And I did it and the audience went crazy, and he walked over to me and put his arm around me and said, 'Baby, don't ever do that song again live until you record it.'" Released in January 1973, Flack's version spent a total of five non-consecutive weeks at #1 in February and March, more weeks than any other record in 1973, being bumped to number 2 by The O'Jays' "Love Train" after four straight weeks atop the Billboard Hot 100. Billboard ranked it as the No. 3 song for 1973. In April of 1973, Canadian singer Anne Murray included her version of "Killing Me Softly" on her album titled Danny's Song. Charles Fox suggested that Flack's version was more successful than Lieberman's because Flack's "version was faster and she gave it a strong backbeat that wasn't in the original". According to Flack: "My classical background made it possible for me to try a number of things with [the song's arrangement]. I changed parts of the chord structure and chose to end on a major chord. [The song] wasn't written that way.". In actual fact the only chord changed by Flack was the chorus chord under "Fingers" which was changed from Major to Minor. Flack plays electric piano on the track. The bass is played by Ron Carter, the guitar by Hugh McCracken and the drums by Ray Lucas. The single appeared as the opening track of the album of the same name, issued in August 1973. Flack won the 1973 Grammy Award for Record of the Year and Best Pop Vocal Performance, Female, for the single, with Gimbel and Fox earning the Song of the Year Grammy. In 1996 a house remix of Flack's version went to number one on the US dance chart. In 1999 Flack's version was inducted into the Grammy Hall of Fame. It ranked number 360 on Rolling Stone's list of The 500 Greatest Songs of All Time and number 82 on Billboard's greatest songs of all time. Hip hop group Fugees covered the Flack version of the song (as "Killing Me Softly") on their album The Score (1996), with Lauryn Hill singing the lead vocals. Their version became a hit, reaching number two on the U.S. airplay chart. The song topped the charts in the United Kingdom, where it became the country's biggest-selling single of 1996. It has since sold 1.36 million copies in Britain. The Fugees recording won the 1997 Grammy for Best R&B Performance by a Duo or Group with Vocal and their video earned the MTV Video Music Award for Best R&B Video. This version sampled the 1990 song "Bonita Applebum" by A Tribe Called Quest (ATCQ) from their debut album People's Instinctive Travels and the Paths of Rhythm. ATCQ themselves had sampled the riff from the song "Memory Band" from psychedelic soul band Rotary Connection's 1967 eponymous debut album. The Fugees single was so successful that the track was "deleted" and thus no longer supplied to retailers whilst the track was still in the top 20 so that attention could be drawn to the next single, "Ready or Not". Propelled by the success of the Fugees track, the 1972 recording by Roberta Flack was remixed in 1996 with the vocalist adding some new vocal flourishes: this version topped the Hot Dance Club Play chart. Flack and the Fugees have performed the song together since then. In 2008, "Killing Me Softly" was ranked number 25 on VH1's 100 Greatest Songs of Hip Hop and number 44 on its list of the "100 Greatest Songs of the '90s". 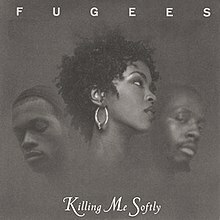 "Killing Me Softly" was the last song the Fugees recorded for The Score, after member Pras Michael made the suggestion to cover it. They wanted to "see how we can create break beats. And of course, we all love A Tribe Called Quest and we went in like 'Okay, let’s cut that sample.'" They then added a bass reggae drop. Initially, the Fugees wanted to change the lyrics of the song to make it anti-drugs and anti-poverty but the songwriters, Norman Gimbel and Charles Fox, refused. The Fugees' version features "percussive rhythms" with "a synth sitar sound, Wyclef's blurted chants, Hill's vocal melisma on the scatted bridge, and a bombastic drum-loop track". In January 1997, Spin called the song "an instant classic, pumped out of every passing car from coast to coast, with Lauryn Hill's timeless voice never losing its poignant kick". Celebrating the album's 20th anniversary in February 2016, Billboard reviewed the song, saying: "It's a lovely cover that maintains the spirit of the original while taking the material in new directions." The video, directed by Aswad Ayinde and based on Lauryn Hill's ideas, never came out commercially in America. It features Roberta Flack. The Fugees recorded a dancehall version with Bounty Killer rapping and Hill singing a rewritten chorus. However, they did not receive permission to release it on The Score. ^ "The "Killing Me Softly" Story". Don-mclean.com. January 21, 2009. Retrieved October 8, 2016. ^ "Classic Albums - Don McLean: American Pie". BBC iPlayer. Retrieved 10 December 2017. ^ a b Davis, Sheila (1984). The Craft of Lyric Writing. Writers Digest Books. p. 13. ISBN 0-89879-149-9. Retrieved 22 September 2010. ^ Cortázar, Julio (1966). Hopscotch. Pantheon Books. p. 15. ISBN 0-394-75284-8. ^ "The "Killing Me Softly" Story". Don-mclean.com. 21 January 2009. Archived from the original on 19 May 2013. Retrieved 31 March 2014. ^ Songfacts. "Charles Fox : Songwriter Interviews". www.songfacts.com. Retrieved 19 December 2018. ^ "Killing Me Softly With His Song - Roberta Flack - Recording". www.pfunkportal.com. Retrieved 19 December 2018. ^ "Roberta Flack Recalls Debuting "Killing Me Softly" At The Greek Theatre With Marvin Gaye". 94.7 The WAVE – Smooth R&B. 27 April 2011. Retrieved 31 March 2014. ^ Whitburn, Joel (2004). Hot Dance/Disco: 1974-2003. Record Research. p. 100. ^ "GRAMMY Hall Of Fame". GRAMMY.org. Archived from the original on 7 July 2015. Retrieved 31 March 2014. ^ "Austriancharts.at – Roberta Flack – Killing Me Softly with His Song" (in German). Ö3 Austria Top 40. ^ "Item Display - RPM - Library and Archives Canada". Collectionscanada.gc.ca. Retrieved 31 March 2014. ^ "Nederlandse Top 40 – Roberta Flack" (in Dutch). Dutch Top 40. 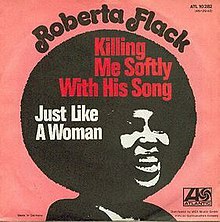 ^ "Norwegiancharts.com – Roberta Flack – Killing Me Softly with His Song". VG-lista. ^ "Swisscharts.com – Roberta Flack – Killing Me Softly with His Song". Swiss Singles Chart. ^ "Killing Me Softly With His Song". Official UK Charts Co. Retrieved 26 April 2016. ^ "Roberta Flack Chart History (Hot 100)". Billboard. ^ a b Purple Rain > Charts & Awards > Billboard Singles at AllMusic. Retrieved 4 October 2011. ^ "Offiziellecharts.de – Roberta Flack – Killing Me Softly with His Song". GfK Entertainment Charts. Retrieved 27 March 2019. To see peak chart position, click "TITEL VON Roberta Flack"
^ "39th Annual GRAMMY Awards (1996)". The Recording Academy. Retrieved May 1, 2018. ^ "The Year in Music - Band of the Year". Spin. Camouflage Associates: 54. January 1997. ^ a b Various Mojo Magazine (November 1, 2007). The Mojo Collection: 4th Edition. Canongate Books. p. 626. Retrieved August 9, 2016. ^ "Fugees Producer Jerry Wonder Talks About The 16th Anniversary of "The Score"". Complex. February 14, 2012. Retrieved August 9, 2016. ^ Iandoli, Kathy (February 22, 2016). "Inside Fugees' The Score, 20 Years Later, With Its Collaborators". Pitchfork. Retrieved August 9, 2016. ^ a b Weisbard, Eric (2007). Listen Again: A Momentary History of Pop Music. Duke University Press. p. 194. Retrieved August 9, 2016. ^ "The Year in Music - Band of the Year". Spin: 54. January 1997. Retrieved August 9, 2016. ^ Partridge, Kenneth (February 13, 2016). "Fugees' 'The Score' at 20: Classic Track-by-Track Album Review". Billboard. Retrieved August 9, 2016. ^ Tardio, Andres (July 29, 2013). "The Fugees' "Killing Me Softly" Video Director Sentenced To 50 Years In Prison For Sexual Assault". HipHopDX. Retrieved August 9, 2016. ^ Coleman, Brian (March 12, 2009). Check the Technique: Liner Notes for Hip-Hop Junkies. New York: Random House Publishing Group. p. 218. Retrieved August 9, 2016. ^ Fox, Charles (2010). Killing Me Softly: My Life in Music. Scarecrow Press. p. x. Retrieved August 10, 2016. ^ "Australian-charts.com – Fugees – Killing Me Softly". ARIA Top 50 Singles. ^ "Austriancharts.at – Fugees – Killing Me Softly" (in German). Ö3 Austria Top 40. ^ "Ultratop.be – Fugees – Killing Me Softly" (in Dutch). Ultratop 50. ^ "Ultratop.be – Fugees – Killing Me Softly" (in French). Ultratop 50. ^ "Top RPM Singles: Issue 3027." RPM. Library and Archives Canada. ^ "Top RPM Adult Contemporary: Issue 9681." RPM. Library and Archives Canada. ^ "Top RPM Dance/Urban: Issue 2978." RPM. Library and Archives Canada. ^ "Top 10 Czech Republic" (PDF). Music & Media. Retrieved 25 June 2018. ^ "Fugees: Killing Me Softly" (in Finnish). Musiikkituottajat – IFPI Finland. ^ "Lescharts.com – Fugees – Killing Me Softly (With His Song)" (in French). Les classement single. ^ "Offiziellecharts.de – Fugees – Killing Me Softly (With His Song)". GfK Entertainment Charts. Retrieved 27 March 2019. ^ "Top 10 Hungary" (PDF). Music & Media. Retrieved 25 June 2018. ^ "Íslenski Listinn Nr. 165: Vikuna 13.4. - 19.4. '965" (PDF). Dagblaðið Vísir. 13 April 1996. p. 38. Retrieved 4 April 2018. ^ "The Irish Charts – Search Results – Killing Me Softly". Irish Singles Chart. ^ a b "I singoli più venduti del 1996". Hit Parade Italia (in Italian). Retrieved 29 June 2018. ^ "Dutchcharts.nl – Fugees – Killing Me Softly" (in Dutch). Single Top 100. ^ "Charts.nz – Fugees – Killing Me Softly". Top 40 Singles. ^ "Norwegiancharts.com – Fugees – Killing Me Softly". VG-lista. ^ "Notowanie nr756" (in Polish). LP3. July 26, 1996. Retrieved February 23, 2019. ^ "Swedishcharts.com – Fugees – Killing Me Softly (With His Song)". Singles Top 100. ^ "Swisscharts.com – Fugees – Killing Me Softly". Swiss Singles Chart. ^ "Fugees Chart History (Radio Songs)". Billboard. ^ "Fugees Chart History (Adult Contemporary)". Billboard. ^ "Fugees Chart History (Adult Pop Songs)". Billboard. ^ "Fugees Chart History (Dance Club Songs)". Billboard. ^ "Fugees Chart History (Pop Songs)". Billboard. ^ a b "ARIA End Of Year Singles 1996". Australian Recording Industry Association. 1997. Retrieved 26 January 2018. ^ "Jahreshitparade Singles 1996" (in German). Retrieved January 13, 2019. ^ "Jaaroverzichten 1996" (in Dutch). Ultratop. Retrieved January 13, 2019. ^ "Rapports annuels 1996" (in French). Ultratop. Retrieved January 13, 2019. ^ "RPM Year End Top 100 Hit Tracks". RPM. Library and Archives Canada. Retrieved June 29, 2018. ^ "RPM Year End Top 100 Adult Contemporary Tracks". RPM. Library and Archives Canada. Retrieved June 29, 2018. ^ "RPM Year End Dance Top 50". RPM. Library and Archives Canada. Retrieved June 29, 2018. ^ "Classement Singles - année 1996" (in French). Archived from the original on May 10, 2011. Retrieved January 13, 2019. ^ "Jaaroverzichten - Single 1996" (in Dutch). MegaCharts. Retrieved January 13, 2019. ^ "Swiss Year-End Charts 1996" (in German). Retrieved January 13, 2019. ^ "Austrian single certifications – Fugees – Killing Me Softly" (in German). IFPI Austria. Enter Fugees in the field Interpret. Enter Killing Me Softly in the field Titel. Select single in the field Format. Click Suchen. ^ "Scoring in France". Billboard. 23 November 1996. Retrieved 8 January 2019. ^ "French single certifications – Fugees – Killing Me Softly" (in French). Syndicat National de l'Édition Phonographique. ^ "Gold-/Platin-Datenbank (Fugees; 'Killing Me Softly')" (in German). Bundesverband Musikindustrie. ^ "Dutch single certifications – Fugees – Killing Me Softly" (in Dutch). Nederlandse Vereniging van Producenten en Importeurs van beeld- en geluidsdragers. Retrieved December 15, 2018. Enter Killing Me Softly in the "Artiest of titel" box. ^ "New Zealand single certifications – Fugees – Killing Me Softly". Recorded Music NZ. Retrieved December 17, 2018. ^ "IFPI Norsk platebransje Trofeer 1993–2011" (in Norwegian). IFPI Norway. Retrieved 15 December 2018. ^ "Guld- och Platinacertifikat − År 1987−1998" (PDF) (in Swedish). IFPI Sweden. Retrieved 15 December 2018. ^ "The Official Swiss Charts and Music Community: Awards (Fugees; 'Killing Me Softly')". IFPI Switzerland. Hung Medien. Retrieved 15 December 2018. ^ "British single certifications – Fugees – Killing Me Softly". British Phonographic Industry. Select singles in the Format field. Select Platinum in the Certification field. Type Killing Me Softly in the "Search BPI Awards" field and then press Enter. Awards for "Killing Me Softly with His Song"